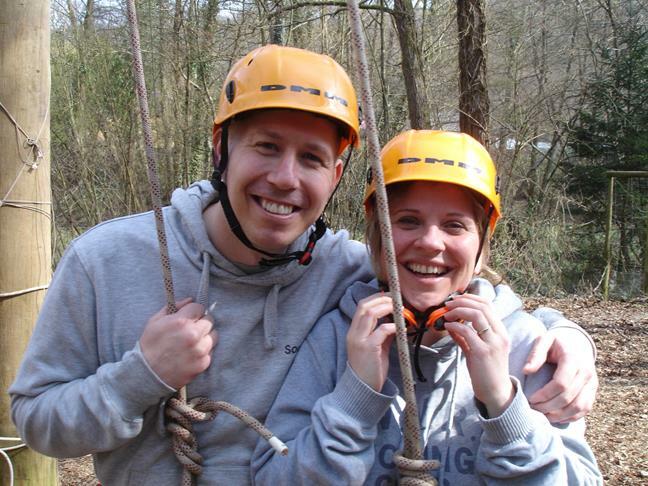 High Ropes and Adventure Ropes Courses in the Wye Valley, Forest of Dean, Herefordshire and Monmouthshire. 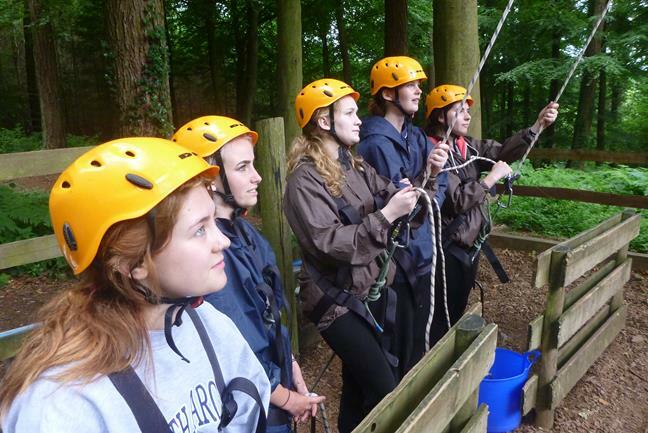 Do not let the name put you off - High Ropes and Adventure Ropes Courses are great fun. 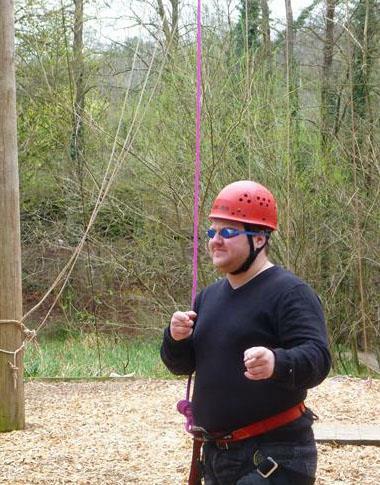 High ropes courses are also fantastic team building events, you wear a harness, a helmet and are tied onto a rope. 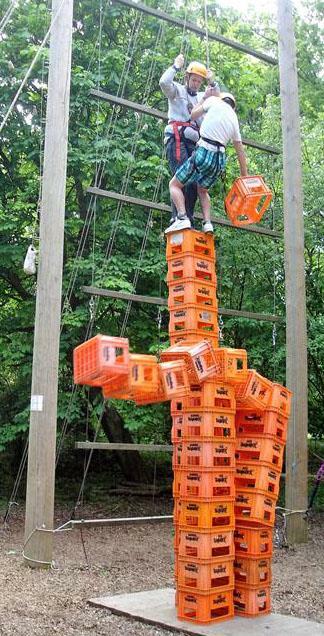 Then you attempt tasks of increasing difficulty and height, all totally safe but really thrilling. High ropes involves activities such as climbing giant ladders with rungs 5 feet apart, building a tower of crates while standing on the top and a final challenge of leaping for a trapeze from a platform 30 foot in the air (the aptly named Leap of Faith). You will be amazed what you can do on a high ropes course. 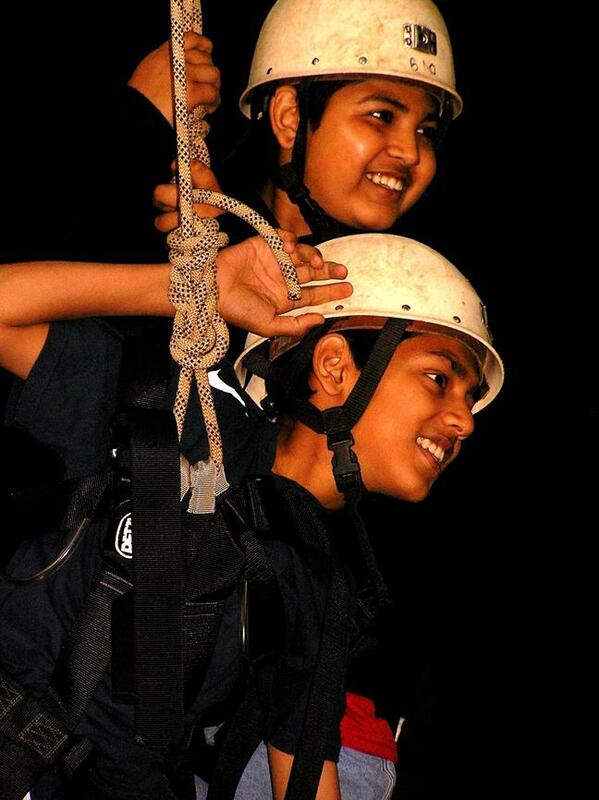 High ropes courses are by their very nature meant to be scary, just like a fun fair ride; they are scary but very safe. If you or any of your party have any concerns about the height or their climbing ability do not worry. All my instructors are highly experienced with dealing with complete novices and their caring attitude will put all members at their ease, allowing everyone to achieve at whatever level they feel comfortable with. Alternatively if you are a natural risk taker then the high ropes challenges can be adjusted to give you all the extra thrills you want but still whith the same high level of safety. High ropes and Adventure Ropes Courses are a great half day session for many different types of Group. We have found that Stag Groups and Hen Parties get a great chance to get to know each other bond before heading off for the rest of the weekend fun. 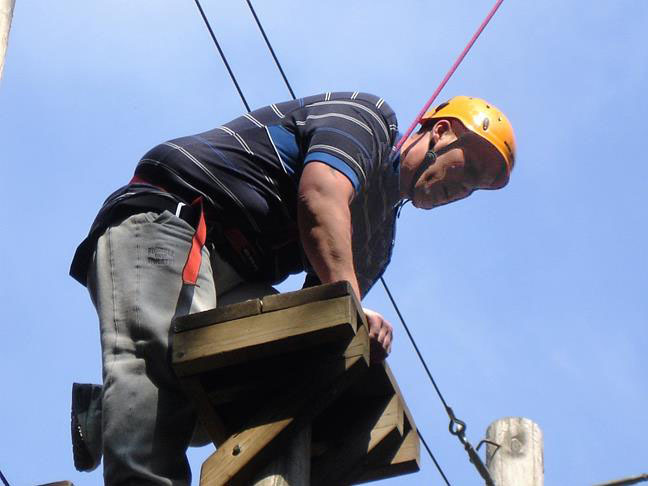 management groups and corporate teams also get a hugh amount from our High Ropes and Adventure Ropes Courses with many companies choising to use our courses to improve teamwork, communication and co-operation and well as promoting leadership and motivation. We can tailor any High Rope or Adventure Rope session to suit your requirements and are happy to discuss how we can incorporate our session into your plans no matter what they are. So for a great day out and all round fun no matter what your age, ability or situation high ropes courses are a really good all round choice. Absolutely fantastic morning doing daring things with my family and friends. I can't recommended it enough. Your instructor was inspiring and made us feel safe at all times no matter how scary it all seemed. I just wanted to say a big thank you to you and your colleagues for the fantastic adventure ropes session on Saturday. You were friendly and patient with us and we found it hugely challenging and rewarding. The whole party said they had a great time. Everyone had an excellent time both wall climbing and doing the survival training. It was a real joy to spend the whole day out of doors for a change. Thanks for the rabbits. We really enjoyed them on Saturday night. I look forward to receiving the photos. We had an absolutely fantastic time on the adventure ropes on Saturday it was good to meet you and the boys and thank you for your assistance and endless patience! I have had loads of great feedback from the other girls saying how good the activities were and how much they enjoyed them. Thanks for running such a fun and exciting survival training session for the family, the children had a fantastic time and are still talking about it. Thanks so much for running such an enjoyable high ropes session for our hen party. Your staff were friendly, fun and enthusiastic and we all had an amazing time. Thanks again. Can't wait for to the photos. Brilliant morning out great guy and everyone loved it such a laugh. 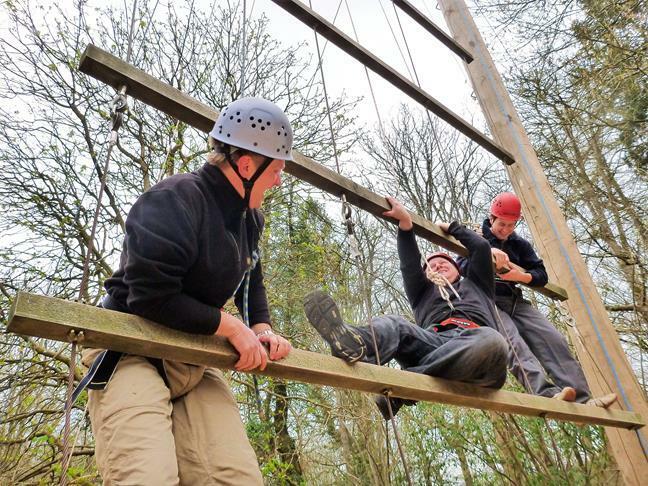 Michael and the team at Life Changing Activities put together a great package and the high ropes followed by the Survival Training and Bushcraft had something for everyone. The staff were friendly and professional and made sure that everyone felt safe during all phases of the activities. It was a great team building experience. I would certainly recommend them. I just wanted to thank you and Martin for really going out of your way to make our high ropes adventure such a success. You eased us gently into the day (especially considering our hangovers) and at the end we were leaping for the trapeeze like experts. You also got everyone laughing and helping each other and it was a great start to our Hen party. What a fantastic afternoon. We were a small group of mixed ability stag-weekenders and couldn't have asked for more. Michael, our leader, was supportive of the group throughout, setting the pace to match our ability. Starting out we learnt the relevant techniques we'd need later in the day, with a focus on safety and teamwork. Provided with access to photos of the event on-line afterwards. Whole event was safe, professional, and most importantly a great deal of fun!